New BSN and MSN Scholarships Available! The Kramer Way Scholarship offers up to $10,000 per semester for Bachelor of Science in Nursing students at the junior or senior level. 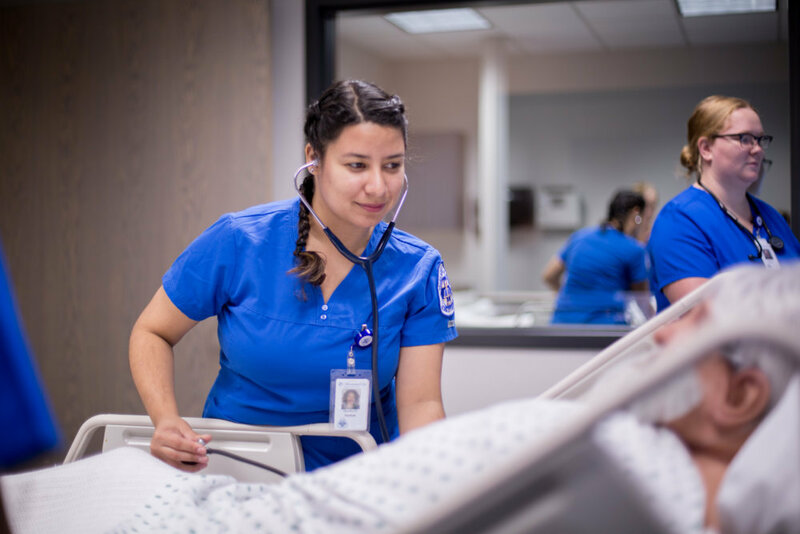 Made available through the generosity of an anonymous donor, these scholarships are ideal for transfer students or for those who have a bachelor’s degree in another field and want to become a nurse. MSN scholarships, which are rarely offered at any institution, are also now available through the Kramer Way Scholarship and cover up to 96% of graduate tuition. Awards are available for a maximum of two years per student. Preference is given to early applicants. Apply today! RN-BSN students are not eligible for the scholarship. No university or school fees, books from the campus bookstore, nor housing scholarships will be covered by the Kramer Way Scholarship. Federal and state grants, outside scholarships, loans, and personal payments can be used to cover the cost of university fees. What is the Kramer Way? KSN is committed to creating an atmosphere of caring, kindness, and respect: the core values of the Kramer Way. These attributes are to be present and visible in all interactions at Kramer School of Nursing, whether the interactions are between faculty and staff, faculty and student, and all other individuals within KSN. It is our belief that learning best occurs in such an environment. We expect it of ourselves; we expect it of our students. Applicants must be accepted into the BSN or MSN program. Applicants must have a minimum of a cumulative 3.0 GPA at time of application. Applicants must provide a 500-word written essay demonstrating evidence of the Kramer Way (caring, kindness, and respect) in their lives. Applicants must provide two references who can support evidence of the Kramer Way in the applicant. Applicants must have completed and submitted the Free Application for Federal Student Aid (FAFSA). The FAFSA can be accessed starting October 1, and completed online at fafsa.ed.gov. Include Oklahoma City University's federal code (003166) on the application. Decisions on scholarship recipients will be made by the Deans with input from faculty and program specialists. Preference is given to Oklahoma students. Applicants who do not have all application materials submitted by June 30 for the fall semester or November 30 for the spring semester will not be considered for the scholarship until the following cycle. A letter of thanks written to the Anonymous Foundation C/O Foundation Management, Inc.
Employment as a Registered Nurse in the state of Oklahoma for a period of two years following graduation. A 500-word essay addressing the following topic: Describe the role the attributes of caring, kindness, and respect has played in your life. Please be specific and give examples. Names and contact information of two references who can support your essay.